Taxonomists and ichthyologists deserve some recognition for the recently brisk pace by which new species descriptions are being published. Here’s a quick look at some of the latest introductions to the ever-growing list of coral reef fish species. 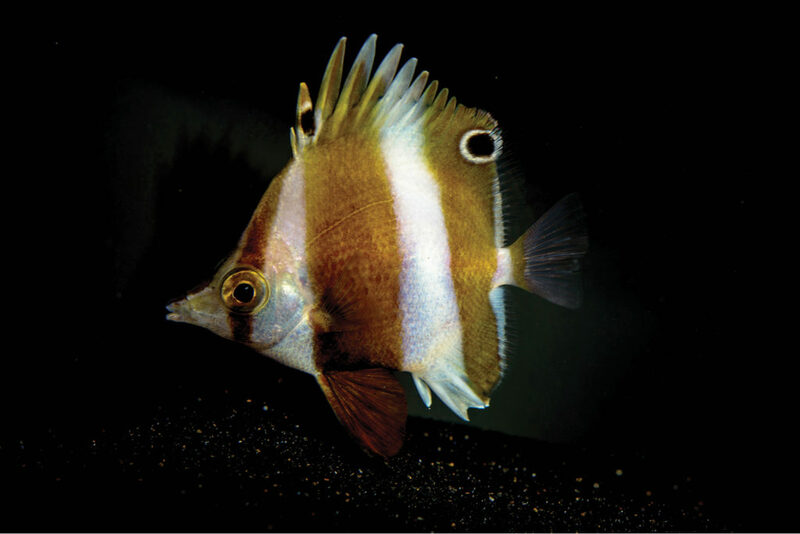 Roa rumsfeldi, the newest species of deepwater butterflyfish. Image credit: Dr. Luiz Rocha. This new species of butterflyfish was technically discovered in an aquarium at the California Academy of Sciences’ Steinhart Aquarium. Originally collected from the Philippines and presumed to be Roa modesta, it was none other than aquarist Matt Wandell who first noticed something was different about the specimen on display in the aquarium’s Twilight Zone exhibit. The entire fascinating story of its discovery and description is chronicled in the article “New fish species sat undiscovered in the Cal Academy for years. Here’s why it’s named for Rumsfeld,” by Michelle Robertson, published by SFGate (the online news portal for the San Francisco Chronicle). Learn more about the new species described in the open access paper, “Roa rumsfeldi, a new butterflyfish (Teleostei, Chaetodontidae) from mesophotic coral ecosystems of the Philippines,” by authors Luiz A. Rocha, Hudson T. Pinheiro, Matt Wandell, Claudia R. Rocha, and Bart Shepherd, published in ZooKeys. Anthony C. Gill, Gerald R. Allen, and Mark V. Edrmann lay claim to another species with the discovery and description of the newest dottyback, Pseudochromis stellatus, from six specimens collected from Batanta and Batu Hitam in the Raja Ampat Islands, West Papua, Indonesia. This new species is the latest addition to a species complex known as the “Reticulatus” complex, which also includes P. reticulatus, P. pictus, and P. jace. The 5th described species, the uniquely sexually-dichromatic P. tonozukai, is better known as the Orange Peel or Tono’s Dottyback in the aquarium trade, and is currently the only member of the complex that aquarists are likely to encounter (even this species is only rarely available as of late). In the absence of any other info, P. tonozukai would be the likely starting point for basic husbandry information should this new species ever find its way to the aquarium trade. While currently only known from the Raja Ampat Islands, the authors offer suspicions that similar fishes collected in Cebu, Philippines, may be the same species. The authors also note that there is apparently another, similar yellow-spotted Pseudochromis that has been collected from various localities in southern and eastern Indonesia and in eastern Papua New Guinea, which may represent yet another new species, possibly more closely related to Pseudochromis litus. This undescribed fish is currently under investigation. You can get all the details for this new species, including several more photos, in the open-access article, “Pseudochromis stellatus, a new species of dottyback from Indonesia (Teleostei: Pseudochromidae),” published in ZooKeys. Burt’s Damselfish, from the Solomon Islands, represents the 6th addition to an assemblage of recently-described species including Chyrsiptera ellenae, C. maurineae, C. papuensis, and C. sinclairi, all of which were cryptic species initially attributed to the Pacific Ocean taxon C. oxycephala. The entire species group is unlikely to be encountered in the aquarium trade. Some argue this is due to comparatively dull adult coloration. 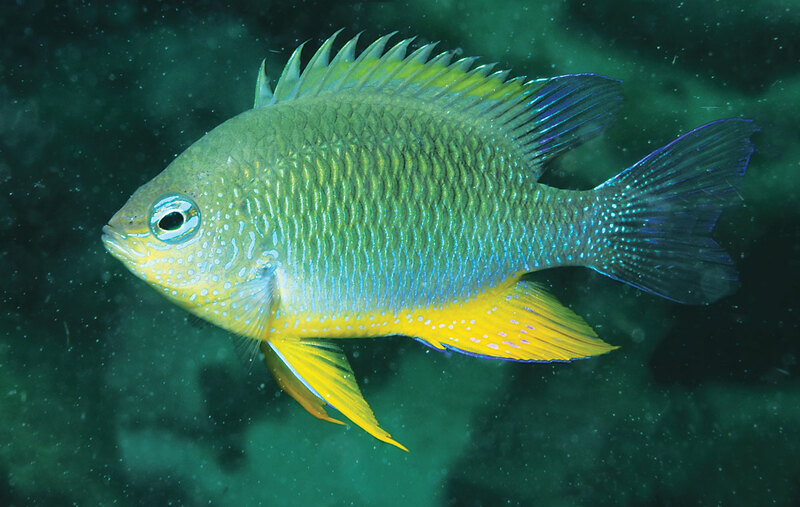 Only a general listing for the “Bluespot Damselfish,” C. oxycephala, comes up in a search for online offerings. While some might feel the adults are rather somber, others may appreciate the subtle beauty of these species, and the juveniles are quite striking. They also appear to be a group of rather small damselfishes, with sizes in the 3-5 cm range (approximately 1.25-2 inches) for the various collected specimens used in species descriptions. Given that the genus is home to some very amenable and easygoing damselfish species, we might argue that, should you stumble across them, perhaps give them a try; you’ll add to our knowledge and maybe enjoy keeping a fish that’s a little off the beaten path while not costing you a mortgage payment. A new species of damselfish (Chrysiptera: Pomacentridae) from coral reefs of the Solomon Islands, by Gerald R. Allen, Mark V. Erdmann, and N.K. Dita Cahyani, published in the Journal of the Ocean Science Foundation: 28 pp. 10-21.
Review of the Chrysiptera oxycephala complex of damselfishes (Pomacentridae) with descriptions of three new species from the East Indian Archipelago, by Gerald R. Allen, Mark V. Erdmann, and N.K. Dita Cahyani, published in the Journal of the Ocean Science Foundation: 17 pp. 56-84.